The Maybins are a pretty big family, by a lot of people’s standards. With their oldest being 19 and their youngest twin boys just 3 years old, they’ve been parents for a pretty long time. It’s amazing that some folks can hold up raising children for that long… I don’t think I’d ever be able to do it! But they’re not stopping at just seven members of the family. 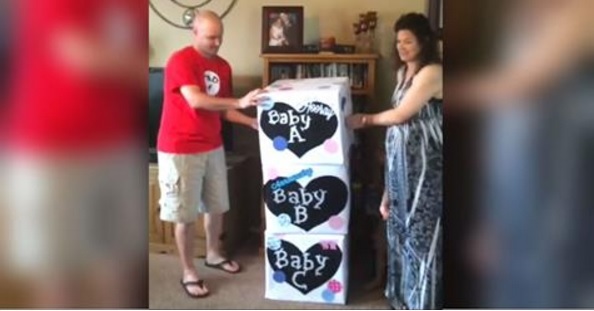 It turns out they’re pregnant once again, and the whole family is really excited about it! There’s another “but,” though. It’s not just one new little one sprouting a leaf on the family tree. And it’s not just twins, either. That would be too easy, don’t you think? That’s right, they’ve got three new babies on the way, which will round out their family from seven to a hearty 10. When everyone got together to find out the genders of the three babies? No one could wait to hear the news, especially the older siblings. Just listen for Madison, the eldest daughter’s reaction when Mom and Dad open up the final box. You can really tell that these three little ones are going to be loved by the whole big, happy family! One thing’s for sure: Mom and Dad aren’t ever going to have to hire a babysitter outside of the family.